7 visiting boats joint the 3 local club members in Brightlingsea to battle it out to be the 2018 Tornado national champion. This years championships were part of the Cat Fest event which Brightlingsea host every 2 years to celebrate Reg White. 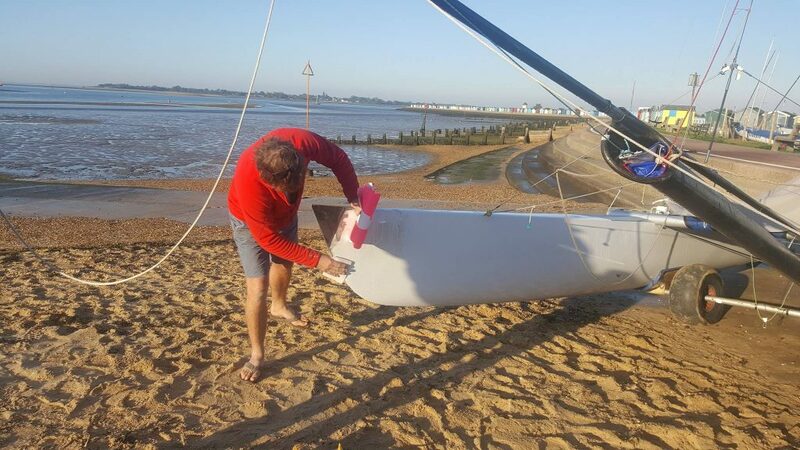 It was great to see some new teams attending the nationals, Robert and David from Whitstable have recently purchased a boat from Weston Sailing Club and John and Josh have recently purchased a boat from Marconi. Saturday morning arrived and the forecast was showing light winds for the day leaving us wondering if any racing would take place. During the briefing the race officer announced an hours postponement, during that time the wind changed direction and started to build. Very soon we were on our way out to the race course in a gentle breeze which was enough to start racing. The race officer started with a very ambitious first course length, the first race took an hour and 20mins and new comers John Payne and Josh Hunt used their home advantage to show us all the way around the course. The course was shorter for the second race which meant closer racing across the fleet, the closest of all the racing was the finish between 2, 3 and 4. Paul Palmer was leading into the finish line, then Andrew Dowley then Jenny Ball. A badly judged gybe from the first two boats allowed Jenny and David Ball to go further, come up harder and cruise past to take a 2nd place finish. The teams were getting braver during the 3rd start and were all bunched up approaching at speed, Andrew Dowley and Tom Brooks had another team had judged the approach badly having to head up early over the line, both teams turned back to start again leaving the fleet sailing away. 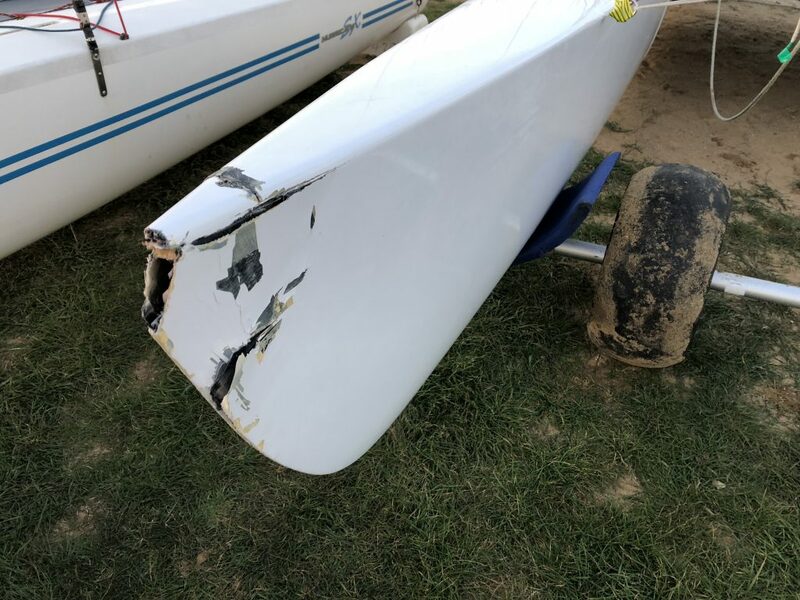 Unfortunately during the 3rd race there was a port on port boat collision between John Payne and Paddy Carr with one boat going upwind and the other coming downwind, they just didn’t see each other. Both limped back to the shore and didn’t finish the 3rd race. As the breeze was building throughout the day possibly the best sailing of the day was the blast back to the sailing club. 2016 and 2017 nationals winning crew David Oakley returned back to the club looking like a Smurf, it turns out wearing a shorty for a long day in September isn’t a great idea. 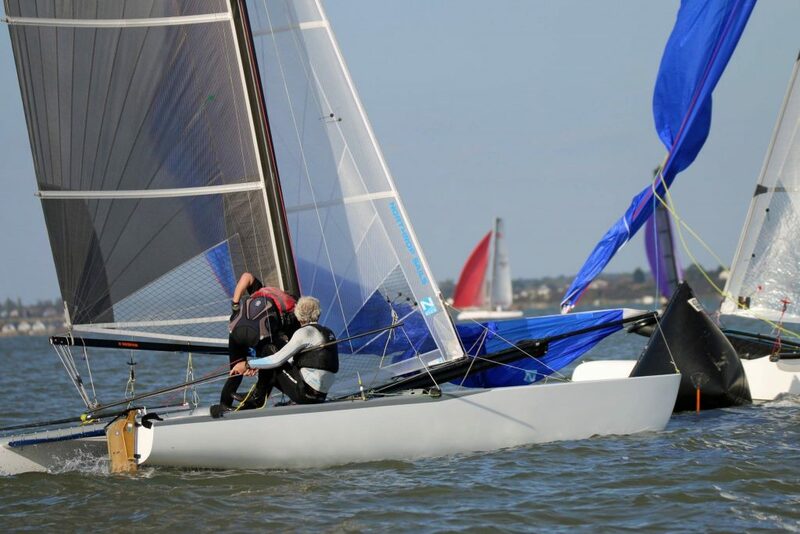 When the fleet returned there was no surprise that John Payne had quickly found local boat building hero Graham Eeeles to assess the damage on his boat, with two 1st places and a DNF John was keen to continue. With a beer in hand Graham calming said ‘I’ll fix that in the morning…..’ The rest of the fleet were not so sure. After racing Robert White went to find class Chairman Andrew Dowley with a rather large box he had found in his loft. It turns out it was a trophy for the winner of the 4th race which was last presented in 1990. On Saturday evening the class AGM was held and Brightlingsea put on another great party as you would expect from Brightlingsea Sailing Club. Sunday morning came and before the sun was up Graham Eeles was at the club fixing John and Joshs boat and of course had it ready for the start of the first race at 10.30am. The fleet launched which took some time with the number of boats attending and the long slipway. Unfortunately the race officer was a bit keen to start and the sequence and race was started without some competitors being in the race area. The wind was blowing from the East and coming over Mersea Island, being further out was going to pay today as there was more breeze. John and Josh put the boat fix to test and took home three more race wins, nobody was catching them this weekend. The sailing was close again throughout the fleet with some superb battles across the fleet with everyone getting the racing they wanted and learning a fair bit along the way. The wait between the 2nd and last race was a bit too long for some and two boats headed back to shore to start the pack down with a reasonable journey ahead of them. That left six boats in the last race with the boats splitting across different sides of the course throughout the race. Overall a superb weekend in Brightlingsea with some great racing, a big thank you to the club.